Italian Wedding Couture is an authentic service by Italian Special Occasions DMC: as a bride-to-be you can create your own dream wedding dress with high fashion designers throughout Italy. The result? An exclusive made-in-Italy wedding gown that is handcrafted with high quality fabrics: no other identical dress will ever exist, adding a touch of class to your image. Italian Wedding Couture exists as a concept, but not as a package. Just like the wedding gown, the travel experience is tailor-made according to the client’s wishes, ideas and needs. 2) and a bride who wants the finest Italian handmade dress for herself (and, optionally, for her bridesmaids and flowers girls too). The team at Italian Special Occasions DMC works with selected, original ateliers around Italy: we work with skilled artisan tailors that create amazing clothing items with passion, with traditional methods and with the finest fabrics. And – for the complete destination wedding experience – we have hand-picked authentic wedding venues full of charm and history in every single Italian region. Are you dreaming about a destination wedding in Tuscany? Make sure it captures the essence and excellence of the Made in Italy experience! One of our favorite high-fashion tailors is the talented Anna Fucà, who is specialized in wedding dresses. Anna creates custom-fitted gowns by hand with high quality fabrics, and sews with extreme attention to detail. 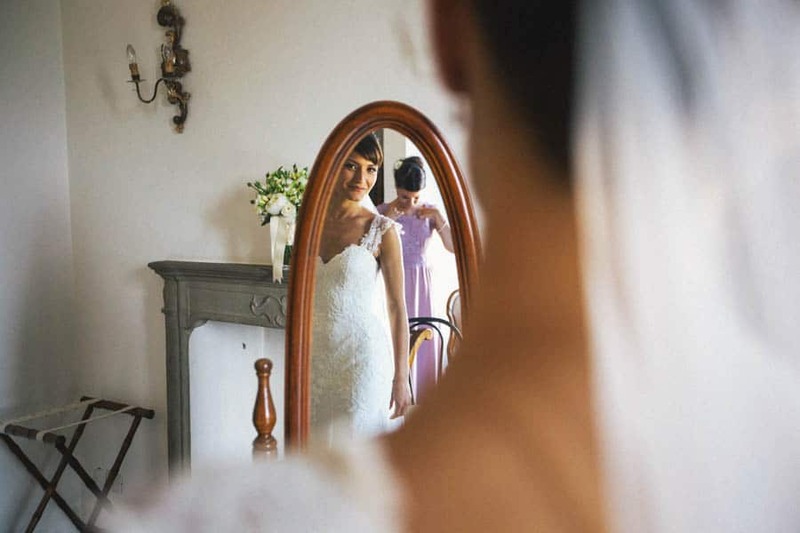 As a bride, you can join Anna in her charming atelier in Florence for more days: she will design with you your wedding gown, as well as the dresses for the bridesmaids and flower girls. You can experience the typical process of high fashion couture: concept design, realization of a paper model, testing in canvas and correction in the laboratory, choice of fabric and finalization. Anna’s final touches will be just before your wedding ceremony, to make sure you look perfect in your dress! During these precious and exciting days, with Italian Special Occasions DMC you can also visit the loveliest wedding locations in and around Florence (or Tuscany), try the most delicious catering services and schedule the logistics for your Big Day! What about your wedding guests? There is a lot in store for them too. After all, if they will be following the husband-and-wife-to-be all the way in Italy, they also deserve an authentic experience to enjoy the culture and essence of Tuscany! At Italian Special Occasions DMC, we thrive on organizing authentic activities that are off the beaten track. Florence is not only about the Uffizi and about Ponte Vecchio! Of course, a visit to the most iconic and historic places cannot be missed, but there is so much more you can do and see to appreciate the town even more. The charming alleys of the Tuscan capital are packed with small artisan workshops, which are ideal for a fashion pit stop. Your relatives and friends can learn how to make handmade shoes, explore the best shops with a fashion expert, visit the Gucci and Ferragamo Museums, admire the Costume Gallery at Palazzo Pitti, and visit the exclusive Vasari Corridor with its unique collections. Tuscan cuisine is famous worldwide… and a foodie tour is an all-time favorite for all groups. Learn how to appreciate wine with wine tasting lessons, and try the most famous dishes – such as bistecca alla fiorentina and the ribollita – and even the less famous ones, like tripe and lampredotto. A visit just outside of Florence will be just as rewarding. Depending on the time of year, it is possible to participate in the harvest of olives and grapes. At any time, groups can visit organic farms and witness the production of Tuscan olive oil at oil mills and of the most famous wines at wineries. If you choose to tie the knot in Italy, make sure it is a true and proper Destination Wedding: both you and your wedding guests must experience the spirit, traditions and authenticity of the local territory! Do you have any questions about Italian Wedding Couture? What do you think about this kind of bespoke service? Share your thoughts below or contact us!